Audience for the 20th Annual James L. Stone Legislative Policy Symposium gathered in the Onondaga County Legislative Chambers. Addressing homelessness, including the implications for public policy, was the focus of the 20th Annual James L. Stone Legislative Policy Symposium held Friday, Oct. 26, at the Onondaga County Legislative Chambers. Syracuse University students in the Falk College’s School of Social Work met with community leaders and activists, legislative representatives and mental health experts to discuss pressing issues involving the state of homelessness in Central New York and beyond, the health and well-being of people who are homeless, and the implications for public policy and social work practice interventions. A signature event in the School of Social Work, the annual symposium has focused on a wide range of topics, such as gun violence, the opioid epidemic, corrections and mental health systems, poverty and foster care. 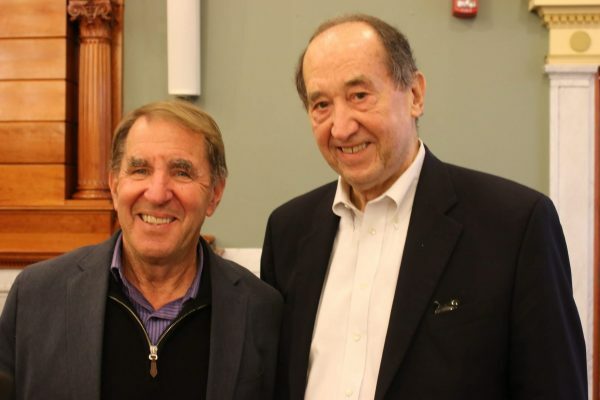 The symposium is made possible by the generosity of alumnus James Stone, MSW ’64, former commissioner of the New York State Office of Mental Health and former chair of the Falk College Board of Visitors, who attended this year’s event. Dr. Robert Okin, professor emeritus of psychiatry at the University of California at San Francisco School of Medicine, delivered the keynote address, “Tackling the Complex Problem of Homelessness,” which explored homelessness and what it reveals about social justice in the United States, among other topics. Dr. Okin previously served as the former chief of psychiatry at San Francisco General Hospital and former commissioner of mental health in Vermont and Massachusetts. He is the recipient of the American Psychiatric Association’s Human Rights Award and author of the book, “Silent Voices: People with Mental Disorders on the Street” (Golden Pines Press, 2014). Dr. Okin also joined the panel discussion “The Lived Experience: Fears, Resilience, and Action” with fellow panelists Mark Horvath, founder of Invisible People and Invisible People.TV; Jawanza James Williams, statewide organizer for VOCAL-NY; and Al-Amin Muhammad, founder of We Rise Above the Streets Recovery Outreach Inc. and recipient of the School of Social Work’s 2018 Dan and Mary Lou Rubenstein Social Justice Award. The discussion was moderated by School of Social Work Assistant Professor Yvonne Smith. During the daylong event, there were a series of three other panel discussions. School of Social Work Assistant Professor Ryan Heath moderated the panel “State & County Legislatures: How they Work & How You Can Work with Legislators” with incoming Onondaga County Executive Ryan McMahon II and state Assemblyman Al Stirpe (District 127), member of the Assembly Committee on Alcoholism and Drug Abuse. Assemblyman Andrew Hevesi (District 28), chair of the Assembly Social Services Committee; Amanda Aykanian, research and project lead for the National Center for Excellence in Homeless Services at the University at Albany School of Social Work; Jamie Powlovich, executive director of the New York State Coalition for Homeless Youth; and Shelly Nortz, the Coalition for the Homeless’ deputy executive director for policy, were panelists on “Homelessness in New York State: Dimensions, Legislative Interventions & Advocacy,” moderated by Keith Alford, associate professor and director of the School of Social Work. The discussion “Ending Homelessness in Central New York: What’s Being Done and What More Needs to Be Done?” was moderated by Alejandro Garcia, the Jocelyn Falk Endowed Professor of Social Work, with panelists Dr. Sunny Aslam, assistant professor of psychiatry at SUNY Upstate Medical University; Andrew Lunetta, executive director of A Tiny Home for Good; Daniel J. Sieburg, executive director of the Rescue Mission; and Megan Stuart, executive director of the Housing and Homelessness Coalition of Central New York. The symposium was organized by School of Social Work Professor Eric Kingson in collaboration with Alford and other social work faculty, and M.S.W. graduate assistant and conference coordinator Alexandra Leigh Kerr. 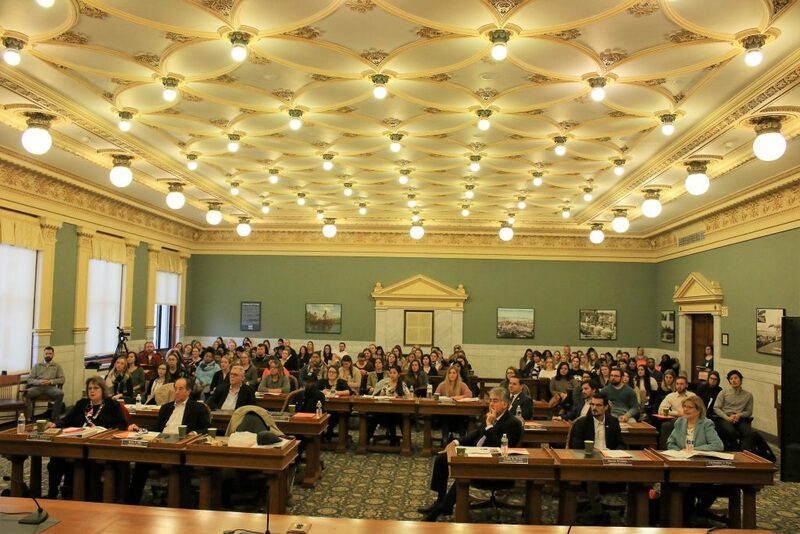 The Falk College and the School of Social Work also acknowledge the Onondaga County Legislature for its hospitality in making the Legislative Chambers available for the symposium.